15 Minutes of Censorship paraphrases Andy Warhol’s famous quote from 1968 : "In the future, everyone will be world-famous for 15 minutes". 15 Minutes of Censorship is an experimental performance art event at Trollhättan Konsthall on May 28 2014 18.00-21.00, in which each artist have been asked to realize a work on censorship. However, giving it a format as an experimental event, we decided not to inform the artists until 10 days before 15 Minutes of Censorship should take place. Neither about the theme nor the time and the material limitations. Asking them to realize a work on censorship using a maximum of three objects not exceeding a time limit of 15 minutes. 15 Minutes of Censorship presents a total of six artists; Shannon Cochrane, from Canada; Jinling Dong and Wei Liu from China; Erdem Gündüz from Turkey, John Court from the United Kingdom/Finland and Vassya Vassileva from Bulgaria/Canada. 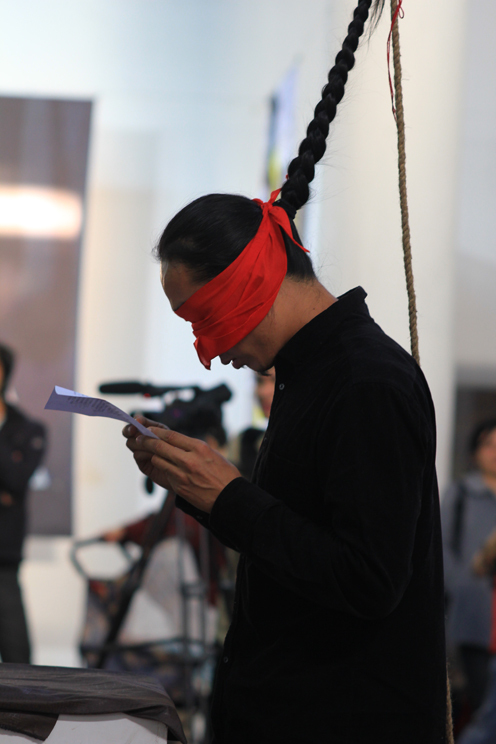 Following the showcase of the performance works, a public discussion will follow on the artists different experiences of censorship in their own practice but also in contemporary art in general and society as a whole. Welcome to 15 Minutes of Censorship, a new event produced by Live Action.